You are here: Home / Guest Blogs / BOCC hearing on Monrovia Town Center next week matters to all county residents and taxpayers! 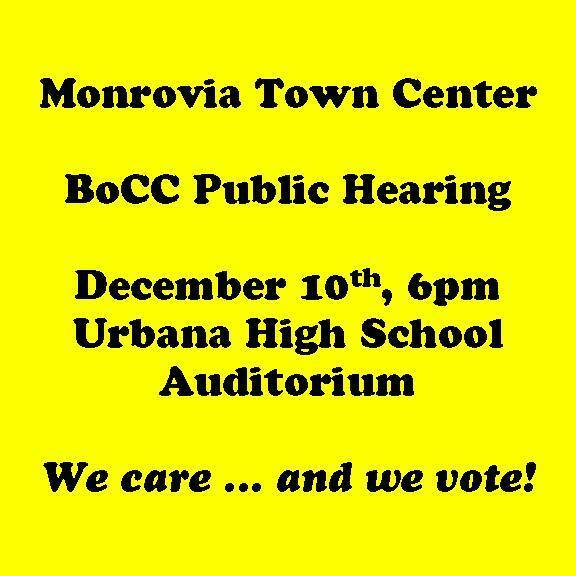 BOCC hearing on Monrovia Town Center next week matters to all county residents and taxpayers! 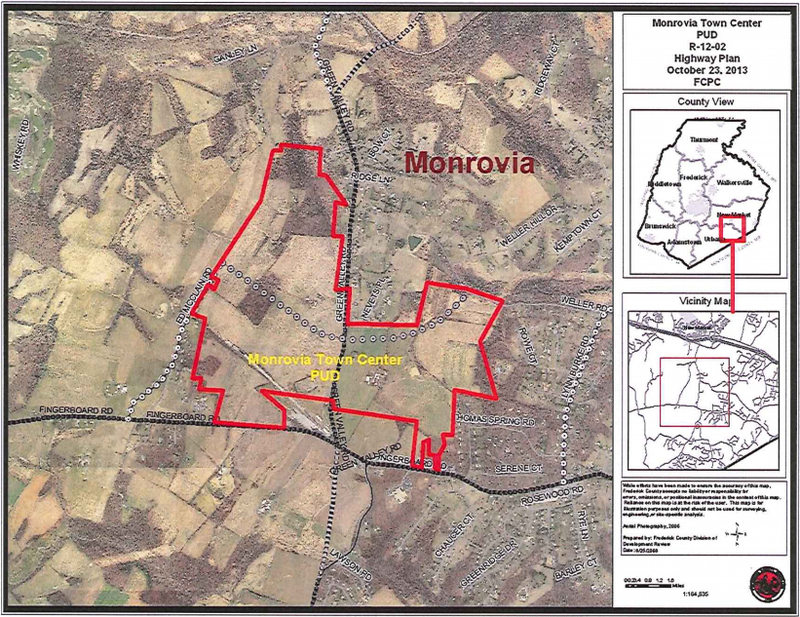 On December 10th the Frederick County Board of County Commissioners will have their first public hearing on the controversial Monrovia Town Center (MTC), which proposes to build another 1,510 homes on farmland in Monrovia. The hearing will be held in the auditorium at Urbana High School. Those who wish to speak can begin signing up at 5:00pm, and the public hearing will begin at 6:00pm. If necessary, the hearing will be extended into the following week to accommodate everyone who signs up to speak (December 17, 18, and 19 have been reserved at Winchester Hall, if needed), the County has stated that YOU MUST SIGN-UP ON THE 10th in order to speak on that evening OR any of the follow up evenings that might be necessary. 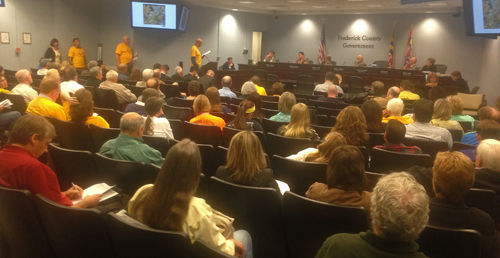 On November 6th, following a contentious 4-night hearing (spread out over a few weeks), the Frederick County Planning Commission narrowly voted in favor of the proposed zoning by a 4-3 margin. Only County Commissioner President Blaine Young’s vote prevented the zoning motion from failing (a tie vote would not suffice for a Planning Commission recommendation). The question of whether Mr Young should have participated at all, let alone voted, given the campaign contributions he has received from the MTC developer is one that may be appealed in the future. In voting against the development, Planning Commission Chairman Lawrence stated that the proposed road improvements were “woefully inadequate” and he repeatedly referred to his concerns about MD Route 75 during his comments and questions. So why does all this matter to you? If you live in Monrovia, I hope you already know what’s going on and understand some of the impacts this will have on our community. Starting with the loss of our small-town community feeling, the farmland, and the sounds of the 75/80 dragstrip in the summer, this development will profoundly change our area. Monrovia, a small, rural town of 5200, will grow to nearly 13,000 new residents. Green Valley Elementary school will be swamped, with no guarantee where or when the next elementary school will be built. The middle schools and high schools that serve our community will also be severely challenged. Again, despite the developer’s pretty banners and mailings (with images of Florida scenery), they are not building a school. There is no guarantee with this plan that a new elementary school will come, nor any plans for a new middle or high school. The road situation is even worse! MD Route 75 is a curving, hilly country road, and cannot handle the addition of thousands of new cars. Frederick County admits this, in fact, and states that it will need to be realigned, rebuilt and extended to 4-lanes because of the new development here. But there’s a hitch – there’s no plan and no money for it! If this development goes forward, the traffic back-ups down near Hyattstown at the intersection of MD Route 75 and MD Route 355 will grow dramatically worse. Along the entire length of Route 75 – from the series of sharp turns near the rail bridge, through the blind, hilly curves going south, and at each and every driveway where a homeowner tries to leave their home – safety will be a major growing concern. As planned, the Monrovia Town Center will take a bad situation and make it far worse. These are not just local issues. The ramifications of the school issues will be felt throughout the county, as the Board of Education is forced to deal with needs of the expanding population. This will happen through yet another round of redistricting, first. But that will not solve the problem. That will require numerous and very expensive new school construction projects. And the traffic congestion and road safety problems will be experienced by commuters coming south along Route 75 (from Libertytown and beyond), as they try to commute to and through Montgomery County. East/west traffic along Route 80 will similarly be affected. The common theme will be growing safety concerns and growing backups, with no solution in sight. Even if these issues won’t affect you personally, as currently proposed, the development will still hit your wallet! The Young BoCC is proposing to eliminate the Impact Fees that developers pay to cover some of the costs of the infrastructure required because of the new development. For the Monrovia Town Center, that is at least $20,000,000.00 to help pay for new schools that will go away. The need to build the schools will not go away, too, however, so that cost will just be shifted to the taxpayers of the county, wherever they live. Not even the 25-year Development Rights & Responsibilities Agreement (DRRA) that is part of the deal with the Monrovia Town Center will change that fact. Whether it is a transfer tax on the purchase or sale of your home, or new income taxes, as recently proposed by Delegate Galen Clagett, the county is busy looking for ways to help the developers and to shift more of the tax burden of new development onto ALL Frederick County taxpayers. You can help stop it. Please come to Urbana High School on December 10th. Sign up to speak and tell the county commissioners that you don’t support this development as it is planned. Remind the commissioners that you care … and that you vote. For more information, contact RALE at ralemonrovia@gmail.com, “Like” us on Facebook, follow us on Twitter (@RALEMonrovia) or visit us at www.ralemonrovia.com. Location and extent of the proposed Monrovia Town Center. Click on the image to open a larger version. The BoCC will hold a public hearing, probably on both the zoning change and the DRRA. We need a huge turn-out to make sure they need to come back for multiple nights. We need them to know in no uncertain terms that we don’t want this and that they will be held accountable for their decisions. Steven lives in Monrovia, and serves as the President of Residents Against Landsdale Expansion (RALE).